Cult what do you think of the baby manticore wings, I think they make the baby less real, maybe swap for the ones I used on my harpies? I agree on Manti-nesting. I find the baby hard to see from the pics, but the idea of leftover victims is what sells it for me. Great idea. Here he is! As BSB he should ofcourse be the one carrying the Roman Eagle to inspire its troops. In the nest are lots of eaten body parts, skulls and some other small scavengers joining the feast. I was considering a cow brought by mama Manticore, but think there will be enough to look at already when painted. Awesome pose! I love the rider. Thanks LD - It's amazing how those images get around the web - glad you take some inspiration from it. By the way that last episode of GoT was a cracker - how cool was that dragon - huge inspiration has got me all fired up again now. Sweet nest! Looking forward to see the details with paint. Rider is cool! Good work with those executioners in general! Thank you Sabious! Yes I agree Cult, it will make playing with my list even more epic because it made it easier for me visualize what is happening in that fantasy world we simulate with our models, terrain and rules. NOTE to painting red: Fire red vallejo model air, washen with agrax, then fire red again and highlighting with little bits on white in it. I still need to finish the Dragon, Manticore BSB, Manticore, 5 Knights, 15 Marines and 19 Corsairs, so that will need some planning and work. Last edited by Lord Drakon on Tue Aug 08, 2017 2:11 pm, edited 1 time in total. I always think of these large monsters as a great opportunity to introduce different colours into the army. So often you can get stuck with painting a metal colour, gold trim, solid base colour for the army theme (like a blue or a red) and when your army units are on the table they all look the same. Nice work - like the timber effect you have going there! The first Corsair! This one is part of the Druchii Marines, the elite bodyguard of the Admiral. When I gave this Corsair that big crossbow, the image of a modern day marine came to my head (M16 instead of crossbow) and the idea was born. I made 10 more of these guys, and have 20 old metal Corsairs. I was too fast to wash has not dried on the armour, and I can definately improve the inside of the sea dragon cloaks on my next models. Some progress on the Corsairs, especially the scales on the cloaks. Plan is to first paint all the scales so the units already have this look, and then complete them in layers. 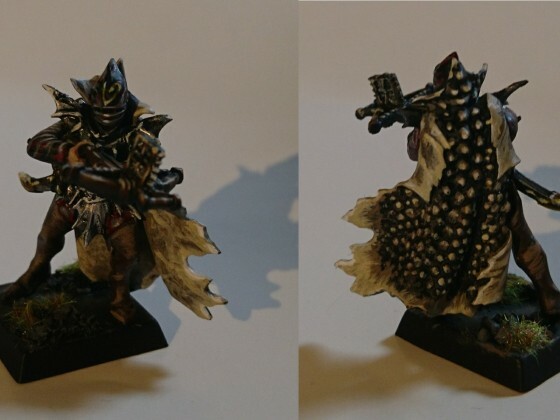 Especially on the old Corsairs cloaks it gives a special effect, I am curious how a full unit will look like from the back. 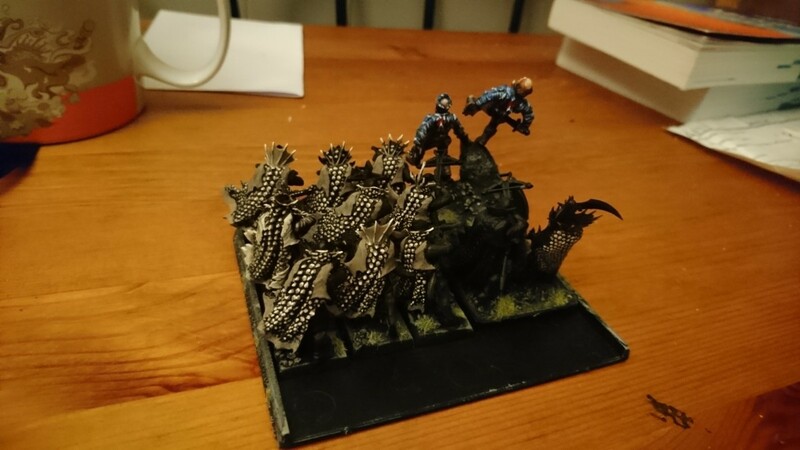 I am moving and will be travelling until februari, so my Druchii are going to be packed until my return. Until then! Happy Travels LD and looking forward to seeing more when you are back! Greetings! This is going to be a long post, mainly directed as myself as plan for the future. As always on long adventures I get a lot of inspiration for my Druchii and I can not wait start painting again. My goal is to become both a skilled painter as great tactician on the battlefield. In this blog I will focus on the modelling and painting of my army, the XIII Legion from Har Ganeth. As I am graduated and we moved so now have a hobby bunker I will be able to dedicate more structural focus and space for the hobby. The army will consist out of lots of silver armour and red cloth, therefore if I manage to improve both my red cloth and silver armour, it will look good. Main focus should therefore to perfect my technigue and colours for those areas. While there will not be much flesh available, as these striking features look great when painted well. I will learn a new technigue: Wet Blending, allowing for smooth transitions between colours enabling NMM and realistic cloth. For this I need a wet pallet. This needs to be purchased and learned how to use. As soon as I will have sparse money, I should invest in a drilling machine, so make it possible for models to be adjusted well (Executioners Draichs). Also needs practice to learn to use. I will use a new way of priming, both black and white, to create grey dust upon black underground. Need to be buyed and experimented with on old models. Most of all I will dedicate time to prepare all my models before painting properly, this I did not do before. Make sure all moldlines are gone, gaps are filled with greenstuff and the model is smooth and clean. Basing will remain the same basic, maybe I could improve the rock colours and the flock. All models should create a WOW factor on their own based on detail and technigue. Contrast should always be an important factor within my painting to both look appealing from close while popping out on tabletop. Based on how much I will be able to improve on my currenr painting, painted units might be repainted. This looks great LD - I'm looking forward to watching your progress! It's good to see you have a solid plan of attack for building your army. I have not been painting for a while now and just starting to get back into it myself. I find the best way with projects this size is to chip away at it each month. Set you self small achievable tasks, you will be amazed at how quickly you can progress. 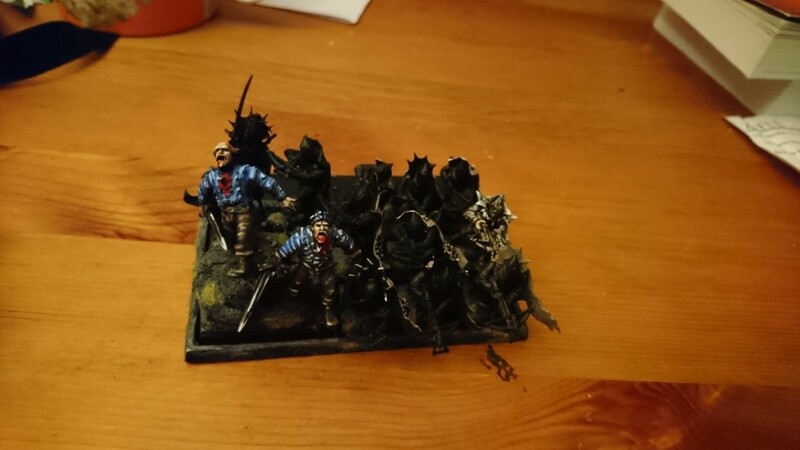 31 December 2018, you should now be able to make Youtube Videos because of a well painted gaming board and army, well done haha! Another good thing I find to do when painting an army is to build a visual reference library of images. Have a scout about on the web for other armies using your chosen colour scheme - they can be a good base to see how the colours work together etc. Thank you for the tip Cult, indeed one of my favourite activities already haha.